Food and drink enthusiasts are expected to flock to the West End of Glasgow in May for a new food and drink festival. The Ubiquitous Chip will be celebrating Scotland’s finest food producers and expert suppliers with a programme of immersive events. From Saturday 19th to Thursday 24th, the restaurant’s six day May Feast celebrates Scotland’s larder. The Chip, as it is affectionately known, has been a champion of local producers and specialist importers since it opened in 1971. May Feast draws upon over 40 years of experience to showcase some of their food and drink favourites. The May Feast will see guests enjoy food and drink from twenty different suppliers and producers. Together, the six events feature ten craft beers, a dozen wines, German sausages and an unlimited number of different whiskies. The festival begins with pies and real ale, from five Scottish micro-breweries, on the afternoon of Saturday 19th. On Sunday 20th, Burns Stewart Distillers will be helping guests to craft their own unique blend of whisky to be enjoyed with the Chip’s 1971 haggis. Do people know the difference between Mangosteens and Langoustines? On the evening of Monday 21st groups of foodies will test their culinary knowledge in a special edition of The Chip’s monthly interactive Food and Drink Quiz. Tuesday 22nd celebrates cheese with a gourmet cheese dinner available all evening in the Brasserie. On Wednesday 23rd the Chip’s roof terrace will be set up for German sausage barbeque accompanied by German wheat beer, Weihenstephan Kristall, and a reading from Kafka’s The Metamorphosis, which was originally written in German. On Thursday 24th, the festival finishes with an exploration of Portuguese wine. The wines will be expertly matched to a three course meal and tutored by The Chip resident sommelier. 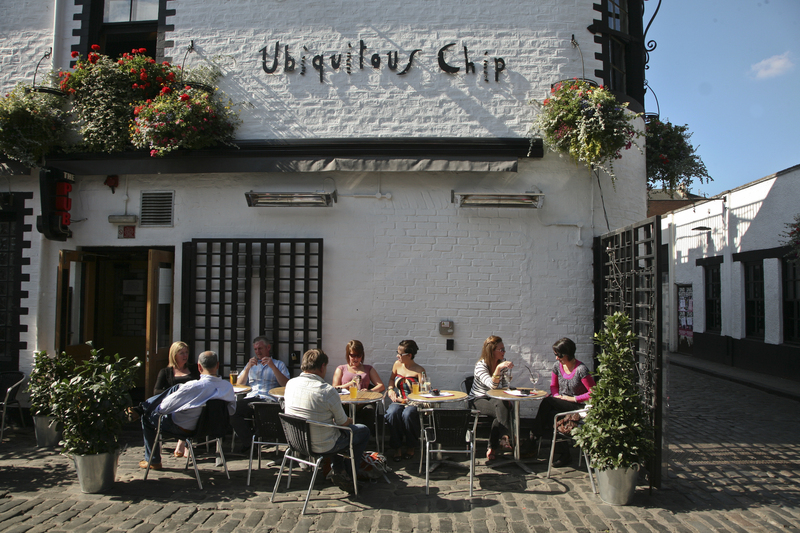 Ubiquitous Chip owner, Colin Clydesdale, said, Great events, fine food and exceptional drinks, all to be enjoyed with good friends. The May Feast is a great way to start the summer.